I actually had some time on the weekend to do some dying. 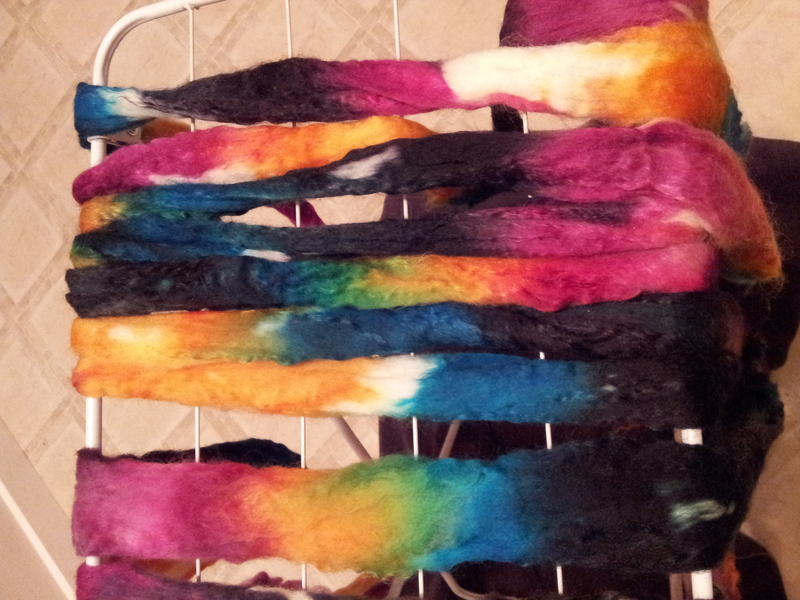 The roving that I dyed was a Wool Mohair Blend. I don’t do a lot of hand painting of roving or yarn, but I think I am going to be doing a lot more after this go around. I have got smarter in my dying career and have learnt by trial and error. If you try something and it doesn’t work, try something else. Artists are constantly trying new things. That’s what makes us artistic. There are two ways that I do my painting. One is rinsing the roving in a warm citric acid/water bath in the sink prior to laying it out, and the other is spraying it with a citric acid/water mixture as it is layed out on the plastic. Either way works well depending on the fibre. 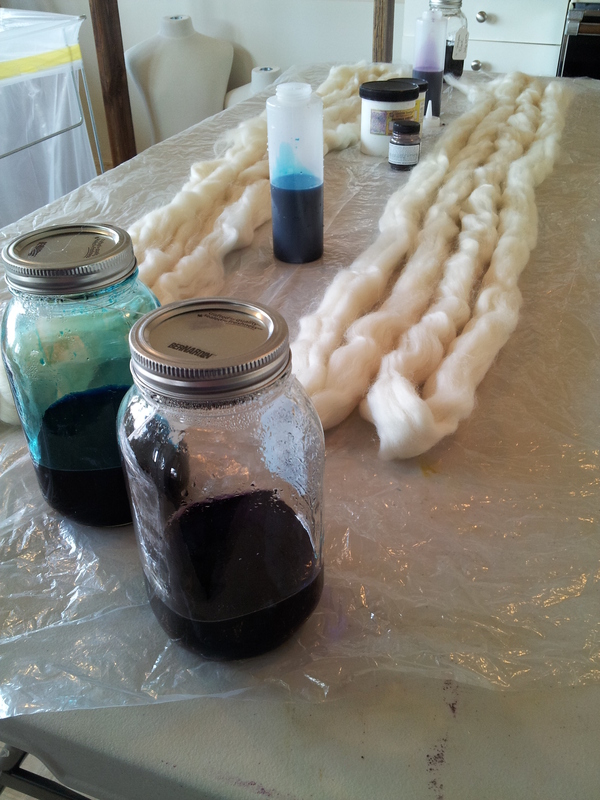 If I am working with Merino that tends to felt easier, I put the roving in the sink and don’t agitate it. Leave it in there for 20 minutes or so, drain the water and lay it out on the plastic that is on your table. Forget to put an acid agent in the water…..no problem. I have done that lots. If you mix a stronger solution of either the vinegar or citric acid and stray it on the roving, it works just fine as well. I have actually sprayed it on after I have put the acid dyes on and it has changed the black to a brown. Not sure why. So just watch out for that. I find if I mix all my dyes ahead of time in jars, then I don’t have too much going on at once. I write my recipe on a card and place it on the jar so I know what the formula was for that particular colorway. I make more then I need so it is there. 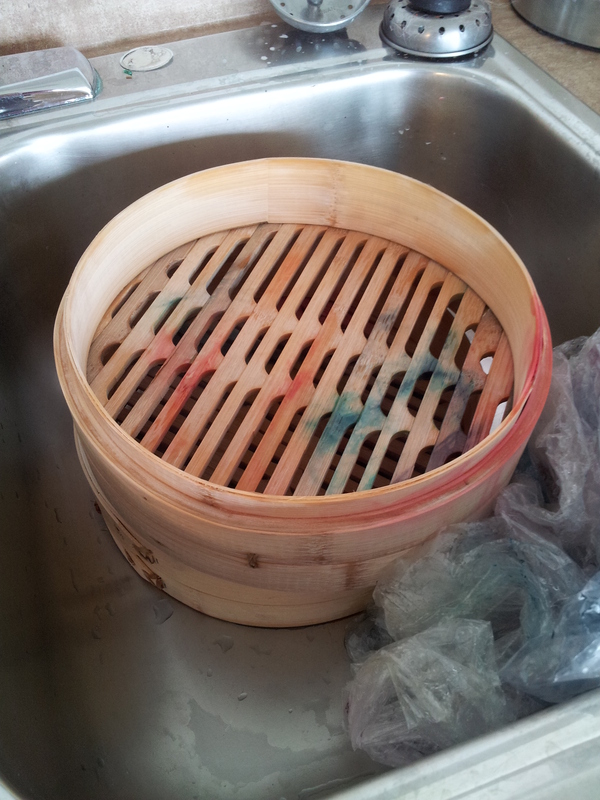 I am now using a Chinese steamer in a steam bath for the protein fibres. I have found that using a pot with a metal rack in it still is too close to the bottom and the heat has melted the plastic that the roving is in. no good! Using the steamers keeps it out of direct heat from the burner and is a more even heat source. I leave it in for about 45min to 1hr depending on what else I have on the go. lol! Before I leave it to cool in the sink, I usually rinse off a little corner to make sure that the fibre has exhausted the acid dyes. 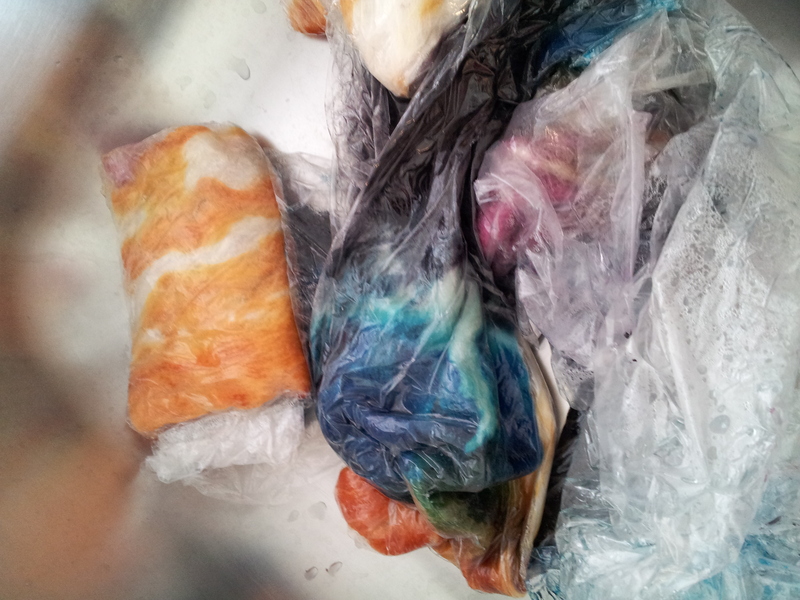 This means that there is no dye left to rinse out basically. There are times where I literally have no color that comes out when rinsed and other times there is a bit that rinses out. Cool it till it is medium hot and rinse it with water that is the same temperature. This will help to not felt the fibre. Leave it in the sink till it has no water left, or grab it wet and hang it somewhere it can drop dry. 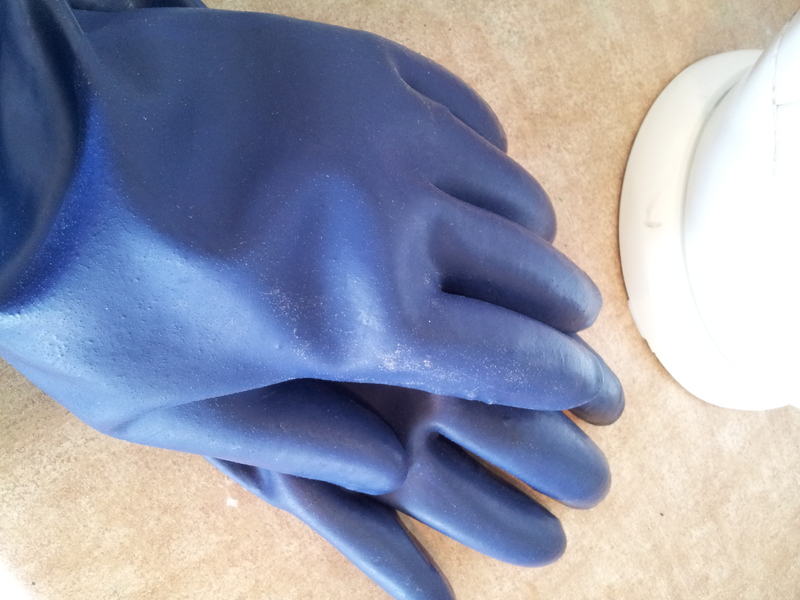 I use some heat resistant gloves that work great. 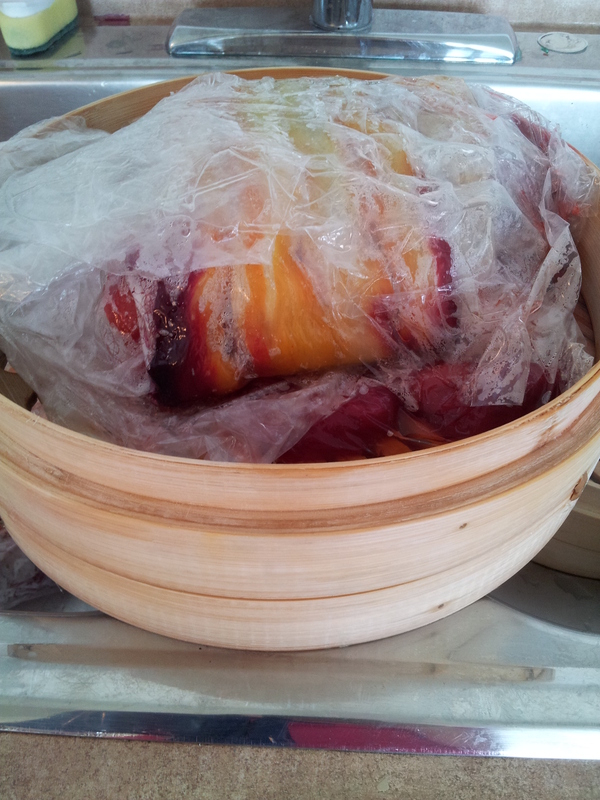 Then I can touch the fibre and also grab the steamers from the pot and not get burned. They also protect my hands from turning green for the next week. They are latex free, have a long cuff so the steam won’t burn your arm and are puncture resistant and also stain resistant. The gloves wash up great in the washing machine. You can find them at http://www.nickelbeeart.com. Once the fibre is dry, I try to separate it a bit to fluff it up and voila, beautiful one of a kind hand dyed fibre. If you have any questions, send me an e-mail. I would be happy to answer any questions that you have.